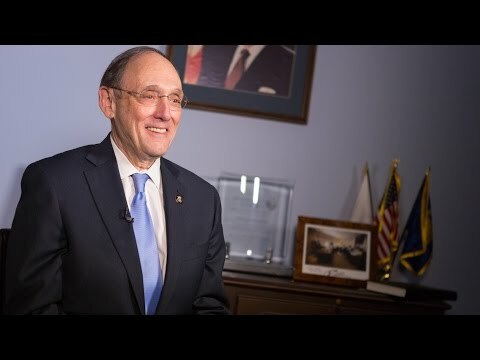 Dr. Phil Roe (R-TN) delivers the Weekly Republican Address. In the address, he discusses bipartisan legislation the House passed this week to strengthen Medicare and permanently repeal the Sustainable Growth Rate (SGR) formula, marking the first real entitlement reform in nearly two decades. Hello, I’m Dr. Phil Roe, and I have the great honor of representing Tennessee’s First District. As a physician, I ran a successful medical practice in Johnson City for 31 years, delivering more than 5,000 babies. Today I’d like to talk to you about strengthening Medicare so it works for everyone from seniors now to a child born today. First, here’s a fact. Right now, a married couple – both 66, both making average earnings – will receive more than double in benefits what they actually contribute in Medicare payroll taxes over the course of their lifetimes. That’s unsustainable. It’s what’s driving our debt, and robbing our kids and grandkids of benefits they’ll never see. Not only that, but due to what’s called Medicare’s Sustainable Growth Rate formula, doctors will soon be hit with an automatic 21 percent cut to the payments they receive for treating patients on Medicare. This only jeopardizes seniors’ access to the physicians they count on every day. Congress has faced this cliff before, nearly 20 times in fact. And it won’t surprise you to learn that each time, Congress has punted, spending your money on short-term fixes without providing any kind of certainty for doctors and seniors. But this time is different. This week, the House passed bipartisan legislation to permanently repeal this formula. Instead, we are delivering the first real entitlement reform in nearly two decades. These reforms ask higher-income seniors to pay a little more for their premiums for Parts B and D, and encourage certain beneficiaries to think more like consumers when it comes to their health care – a concept we know is the right approach to reducing health costs. Both reforms will be phased in over time. For seniors, this will end years of needless concern and frustration that care will suffer from arbitrary cuts. For families, this will mean a more stable Medicare program to care for their elderly parents. And for taxpayers, this will result in a huge amount of savings 20, 30, and 40 years down the road. Of course, much more needs to be done. Like you, my to-do list for fixing our health care system is pretty long. We need to repeal the president’s health care law. We need to put the focus on patient-centered reforms that lower costs. And we need to make the real reforms necessary to ensure Medicare and all our entitlement programs can serve future generations. For now, this is progress, and it’s an example of what we can accomplish when we focus on finding common ground.